Those of you who have been following this blog or Iran news in general for the last year or so may be familiar with Majid Tavakoli's name. He was one of the three students who became known as the 'Polytechnic Three', along with Ahmad Ghassaban and Ehsan Mansouri, students of Tehran Polytechnic who were framed for producing publications that insulted Islam. Nothing of the sort was ever proven and in fact it turned out that the Baseej students had falsified a publication and produced insults against Islam themselves in order to frame the three. Now Majid Tavakoli is in trouble again. He was arrested during the 7th December protests. This time the security forces wanted to take revenge on him in another vindictive way. 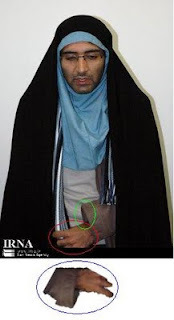 Pro-Ahmadinejad news agencies like Fars and IRNA, published pictures of Majid Tavakoli wearing a chador and said he was arrested while trying to escape dressed as a woman in a chador. In their warped minds just to add more venom in their humiliation attempts, they even reported that he was also carrying a woman's handbag. Apart from the fact that their photoshop touched pictures were extremely amateurish, just look at the thumb facing the wrong direction and the sleeve hanging the wrong way in their photoshop attempt above, they forgot one even more important fact. Our women have shown so much courage and like true lionesses they have been at the forefront of the struggle against this regime for so long, that trying to describe a man as a woman not only is not an insult, it is even a badge of honour that depicts fearlessness. Far from discrediting Majid Tavakoli, the move has boosted his popularity. Whatever they force Majid Tavakoli to do or say in the next coming days will be worthless, for everyone by now knows their barbaric methods of extracting confessions from detainees. All the regime has done is once again displayed its contempt for the women of Iran. Only two more days [to Monday's demonstrations]. I have spent ten exhausting days on the road with more than 100 hours of driving and now I have to leave for Tehran. Looking at my mother’s tearful eyes and father’s anxious glances and despite all the difficulties only the true wish for freedom can maintain my drive and steadfastness. And so once again I welcome and accept all the dangers, standing next to my friends with whom I am honoured and proud to be on 16 Azar shoulder to shoulder we will shout against tyranny. For Freedom.